Wurlitzer and The Coca-Cola Company have teamed together to present a beautifully crafted home and office refrigerated nostalgic soda machine. Wurlitzer, known for quality music and vending products worldwide, has painstakingly replicated the famous "Coca-Cola" Model 44 vendor. 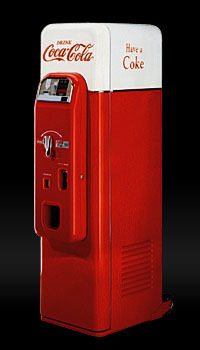 Originally introduced in 1956, this "Coca-Cola" vendor is the most cherished and collected soda machine ever made. Unlike the original, which vended only one selection, this unit stands ready to serve two of your favorite "Coke" beverages in either cans or bottles. Requiring floor space of just 16" x 18", it meets small space requirements. Combining today's technology with the tradition and heritage of "Coca-Cola", Wurlitzer just created another collectible.